I had been wanting to try out a synthetic wig for awhile so I decided to browse the web to see what I could find. I found a few cute ones that I thought I could pull off and ended up settling on Tammi. I purchased it in a color 2 which in the Freetress line is off black (their colors run dark compared to other brands). 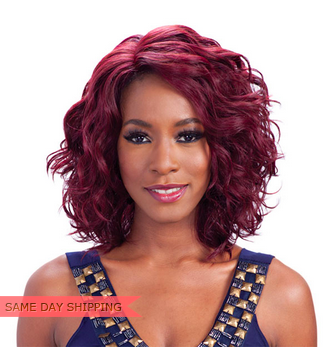 The wig has a loose beachy wave and the length comes to slightly above/below the shoulder. After unboxing the wig, it clearly needed some work. The part is so narrow and really unrealistic. I took my tweezers and use them to make the part a more natural width. Then, I used some brown colored eyeshadow to make it look more realistic. I actually have a YouTube video on that if you're interested in watching. I also tweezed the hairline because it had that half moon shape. Next, I had to flip the wig inside out overnight on my wig head because it had that typical cone shape going on. The "lace" (if you can call it that) is so hard and itchy, really uncomfortable. Not sure if there is a remedy for that though. Anyway, here's a few pics.